Rate the Dress: a 1770s belle in lacy bells? 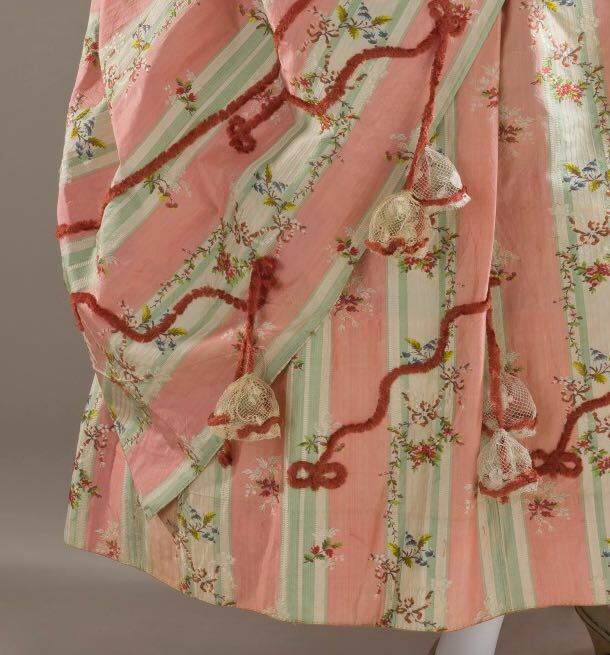 Last week I showed you Elizabeth Craven, Lady Powis, in her all-over embroidered early-Stuart jacket and skirt. It’s an outfit that I love SO MUCH. Everything about it makes me happy. It’s got blossoms and berries and birds and bees and bugs and other ‘various sundrie spottes’. It’s like Spindle’s End got turned into an outfit. I want it, oh, I want it! 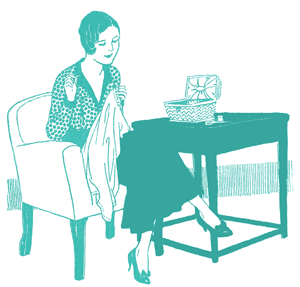 The only reason it isn’t top of my sewing list is that I would be 70 before it was done if I started today. And many of you agreed, giving it a satisfying 13 of 27 10/10. But some of you who didn’t agree really didn’t like it much, pulling the score down to 8.8 out of 10. That’s OK, I still adore it! A confession: I just wasn’t feeling Rate the Dress this week. 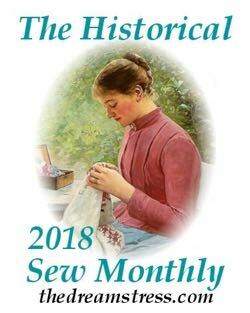 We spent the weekend painting the house, and cleaning the house, and my Mon & Tue work schedule was incredibly hectic, and I just didn’t want to blog. The post on privacy and perfection got published only because it was already written. But it’s Wednesday morning, and I feel a trifle guilty about the lack of RtD, and (more to the point), Felicity has occupied my lap, at a moment when I don’t have much else to do on the computer. So, courtesy of Felicity, you get a RtD! And you know what? I’m quite excited about it now that I’ve committed to it. I did what I usually do when I’m out of inspiration: pick a museum at random, and a costume term at random, and see what turns up. So, all in all, not the standard, boring dress I saw at first glance at all! I imagine the lace bells would sway and bounce with the movement of the wearer, further adding to the layered, ornamented, embellished, all-encompassing Rococo sensibilities. So what do you think of it? Are the bells just mad enough to be fabulous? Does the whole think work as an ode to perky, bouncy, über-feminine, pink-and-green, rococo-ness? Or is it terrible and overworked and over-saccharine? 10. That is a magnificent dress and those shoes are flat awesome. 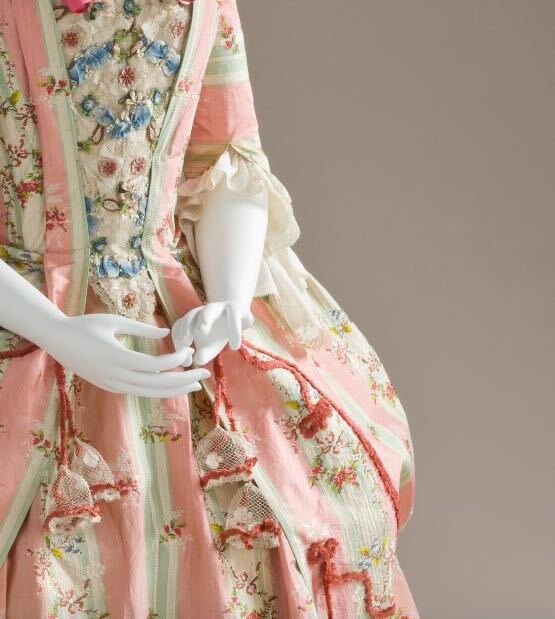 I’m usually quite divided about 18th century dresses; for me, there is a fine line between pretty and, well, not. This time, however, I am absolutely taken with this dress. It’s lovely! I love the colours and the folds, and it all just goes together so well. The lace bells are fantastically unique. I love it! Quite crazy but very delicious. Love the fripperies – who thought of the little lacy bells? It’s 10 on all counts. Thank you, Leimomi and thank you, Felicity! I was missing the “Rate the Dress,” but I figured that you were just too tired/busy to post one, then this interesting dress showed up! I like the pink of the gown (though the shoes should be pink, instead of green, darn it). I like the late 18th century silhouette. But the chenille trim and lace, uh bells, are a bit much for me. 5 for the good features + 2 for originality and nerve = 7. It’s definitely a bit much, but in a good way, I think. The lace bells and chenille trim are sheer mad fashion genius, and pair adorably with the fabric. I’m a fairly new commenter (or rather, I’ve been reading for four years, but have only actually participated in a Rate the Dress once, a year or two ago.) so I’m not entirely sure whether we should be Rating the Dress, or the Outfit… as a dress alone, I’d give it a 10 for a perfect combination of pluck, whimsy and classic mastery of fabric. 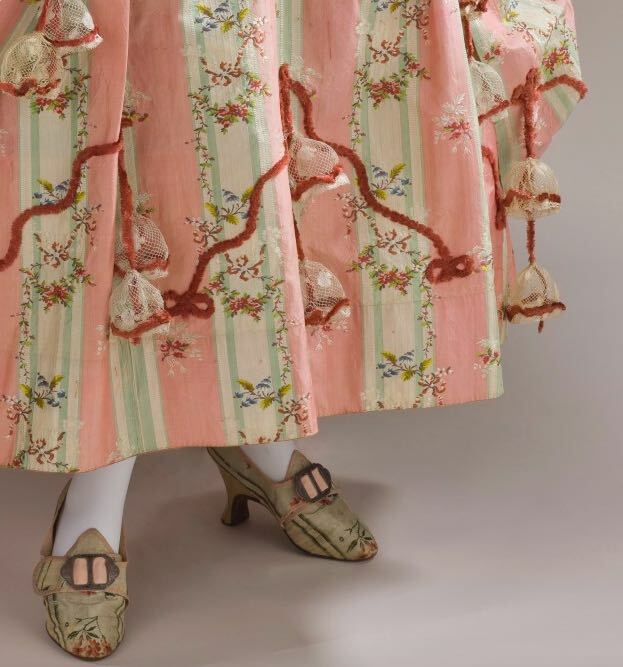 But as an outfit, I’d have to take two points off– one for the stomacher, and one for the shoes. I’d like the stomacher just fine with a different dress, and slightly better with blue shoes, but even though it’s well executed and matches the colors of the dress all right, it’s the wrong texture. The shoes just have nothing to recommend them to me, and as an aside, that pink bow at the top is completely the wrong pink. so, 10/10 as a dress, and 8/10 as an outfit. What fun the dresses of this time are! Frilly and Feminine – I think it’s stunning. 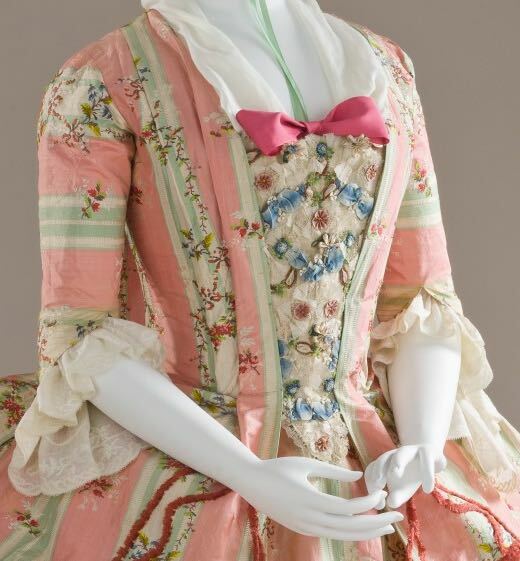 I love the stomacher and how it echoes the pattern on the fabric. I love how the pink bow is a bit brighter than the rest of the pink in the dress. I do wish the chenille were a brighter color to match, a green for the stripes or a blue for the flowers in the print – but I love the application and little lacey bells. The first time there’s a nail even slightly sticking out of something, those bells are going to get shredded. Also, with them all swaying around, you’d look like a jester. Shame, because without them it’d be fairly nice, but they’re such a bad idea that this dress gets 2/10 from me. Wow, it’s delicious! I love those bells and the colours, but I just get the feeling that at any second a flock of sheep are going to come charging over the horizon and the wearer will be forced to herd them up! It’s just a bit too China shepherdess for me to give it ten, so I’ll give it 9/10. The shoes are also gorgeous. Oooh yes, I agree, uber-feminine and frivolous and sweet and eccentric. I adore the shoes. The lace bells are a bit strange though. 8/10. All I see when I look at it is wallpaper, normally I love eighteenth century, but this is just not doing it for me, possibly because we had a navy and pink version of this on the walls when we moved in. Oh that’s SO much fun!!! I love it. It looks fresh and bouncy and springy and lively. Put a big smile on my face just looking at it, after a pretty grim morning. 10/10. SO MUCH JOYFULNESS. I just go back and look at it and smile all over again. I don’t know what it is about this dress, but it’s really cheered me up no end. This dress has so much going for it, and then it kind of crashes. It’s like on Project Runway when Tim says they need to edit. 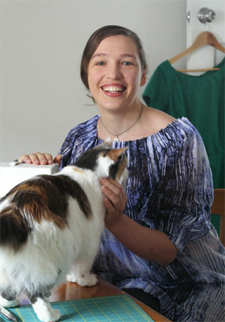 The designer had a lovely fabric and made a lovely dress, but they couldn’t stop. They thought they would add this contrasting trim and then they thought “Ooooh! I know what this dress needs! Little hangy lace bell things!” Oh dear. And I usually like wacky and sweet! If it didn’t have that trim and the silly pink ribbon on the top I would give it a 10/10. But the trim is so bad. So 7/10. I almost loved it at first glance, but found the red squiggles awkwardly placed and poorly chosen in color. A closer look, revealing the bells, did not help this impression. They’re so oddly stiff and mechanical for 18th c. lace, which usually has a lovely organic seafoam texture–totally lacking here. I’m not even convinced the red-n-bells is original to the gown–was someone trying to “spruce up” the gown later and decided “hey, glaringly clashing color, that’ll do it!”? I don’t know. It worked until it didn’t. 7/10 because it’s nothing some time with a pair of embroidery snips wouldn’t fix. I’m completely biased in favor of most 18thc wackiness, so I freely admit this is coloring my review! And, well, I love it! At first glance it just looks like the picture of Spring to me. Very pastoral. The bells are ridiculous, but being made of delicate lace, they don’t stand out obtrusively….and I think they’re a good ridiculous! The only thing I don’t love is the color of the chenille; I think I’d prefer something that harmonizes with the dress a little more. 9/10! I rather like it in all its quirkiness! The color is just too lovely for words. I don’t quite care for the combination of the chenille with the stomacher looking entirely different, so 7 out of 10. This polonaise is not my favorite 18th century style, but I am smiling from ear to ear and can’t stop. It’s over the top – and I love it: the fabulous colors, the funky and totally unexpected chenille trim (?! ), the lace bells (?!?! ), the embroidered stomacher with just enough blue to set it apart, the not-perfectly-matching shoes…altogether too much, but in a good way. As Daniel said – SO MUCH JOYFULNESS! I really can’t stop smiling. Easy-peasy – 10/10. Isn’t it amazing how, when you point something out, everyone suddenly sees it? Now the chenille trim and lace bells are bringing the rating down for some people. I like it. 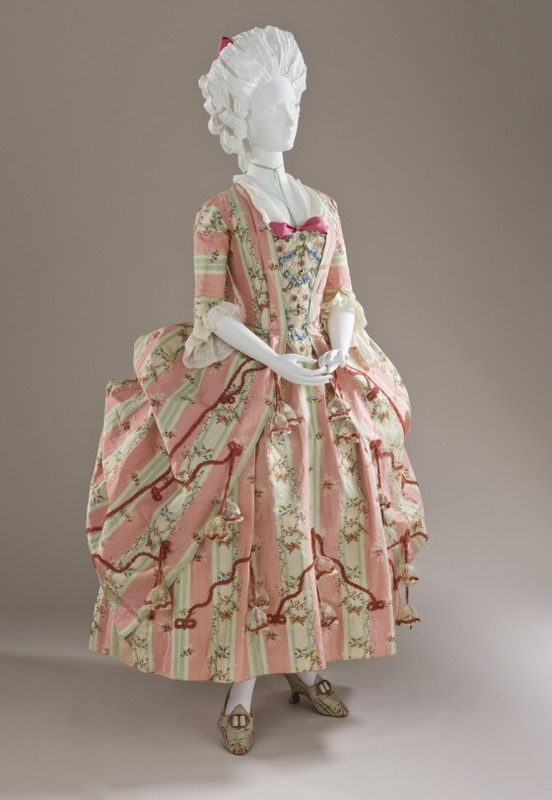 I think I like it as much as I can like a sweet, poofy 18th century dress, myself. 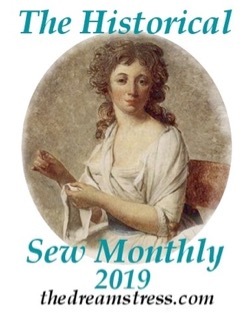 And the chenille and lace bells actually help, because they’re fairly simple yet idiosyncratic, as 18th century trimmings go, and I like that. So, with a full acknowledgement of that personal bias, 9,5/10. Not a full ten, because it’s not quite an instant ooh; the chenille trim does clash a little. I love it, it is quite bonkers in the best way. It must have been a lot of fun to wear, or maybe it wasn’t, which is why it is in such good condition and never got worn. I wonder who thought, hey let’s make lace bells! And put this chenille on it! How these decisions are made. It’s fascinating. *grabby hands* I wants it! It’s pink and green and stripy and has a print and trims? Why have I not re-created this yet? Oh what a delicious, fun pink cupcake of a dress – LOVE it. It is so short that you can skip about in it, presumably to milk your cows in your very own fake farmhouse dairy or some such. The delicate pastels are fresh and feminine, and the red squiggly trim pattern creates some visual punch to keep it from getting boring. The only thing I don’t like is the blue lacy stuff on the stomacher – really doesn’t fit the overall colourway. It still makes me smile from ear to ear when I see it! I have absolutely NO idea why, but it does! That’s fantastic! Pretty much the best compliment you could give a dress! 10. 10 10 10. I saw this post on Facebook and actually dreamed about the dress last night, a lovely dream of spring and lambs and shephardesses. It’s delightful. Ooh, thank you Felicity! Cats have a rather wonderful habit of being in the right place at the right time, don’t they? I love this dress so much! I might be wrong, but could it be that the ‘lace bells’ might have had some sort of herbs in them to ward off fleas? I’ve heard of little vials with some sort of flea repellent in them handing from the inside of the great pannier dresses, and so perhaps this might be a same concept, just made to look decorative? This dress for me would be a 10/10, but I think that the hot pink trimming clashed just a bit too much, so it’s still a high 9.5/10. It’s a happy. pretty little dress and I love it. The chenille is a little too bright, just tone it down a bit because it fights with that glorious stomacher. I still love it. I tend to have faith in Daniel’s judgement, but this time we part ways. When I was a gel, dressing tables (anyone still have one?) had skirts. The tables could be oblong or kidney shaped (very trendy for a while). This kind of striped fabric had a revival at the time, and this was the kind of thing one would use to make a swagged skirt for one’s dressing table. Easter Eggs (made out of rock-hard icing) also came in similar colours and patterns. One could push the boat out and have bobbles and trims and squiggly bits as well as the floral stripe on either the table or the egg. You see my problem? The dress makes me twitch. The shoes are wonderful. Actually all that sounds like even more pluses to me…. it’s just so much fun. Silly but fun.